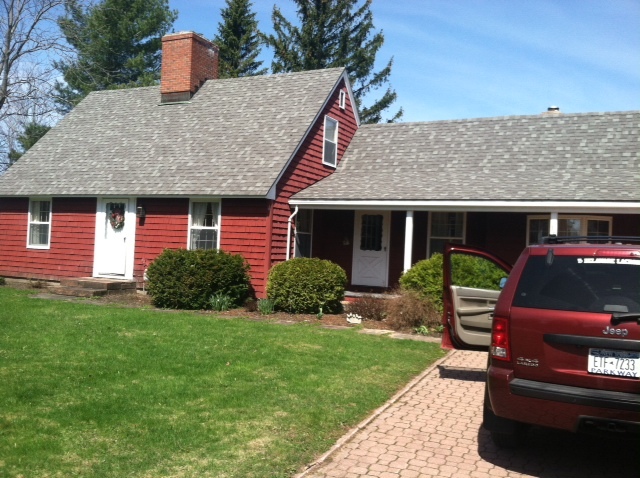 Friday a week ago, we closed on our new house in Canton, NY. About half my stuff from Georgia arrived today, including the comic books, CD’s, DVD’s, and various other things I collect. It’s been tough being without them, but not quite as tough as I thought it would due to how fully booked my time is. Unfortunately, the moving van was so high, when he pulled forward on our street, he took down a major branch from one of our trees and split the trunk. We’ll have to see if the tree can be saved. When you live in a small town, everyone knows everyone and everyone knows their house too. The house we bought had only one previous set of owners: John and Shirley Wells. John was the head of SUNY Canton’s Construction Management program for many years and was a master craftsman. The house shows it everywhere you look. Several times a day, someone asks me if we’ve settled in yet. When I tell them we just closed on a house, they want to know where it is. When I tell them “Judson Street Road” (no, I don’t know why it is both a street and a road), they all say “You mean the Wells house?” When I answer yes, they say either “Oh—I love that house” or “That’s my dream house”. I’ve heard those things over and over. The house is a pretty red cape with a breezeway/porch to an attached two-car garage. The driveway is made of red brick pavers, perfectly laid out by hand. Going into the garage, there’s a set of pull down stairs that leads to a large overhead storage area, more than high enough to stand up in, with a finished floor. The back of the garage doors are a work of art, made of beautiful stained wood. They were the first thing that struck me about the house—who bothers to make the back of a garage door attractive? Well, John Wells did. Walking in the breezeway door, you find yourself in a little hallway. Right in front of you there’s a set of pegs in the wall to hang jackets or hats, as well as a stained glass window, shared with the kitchen on the other side. There’s also a set of wooden drawers in the wall, to hold mail or keys or what have you. 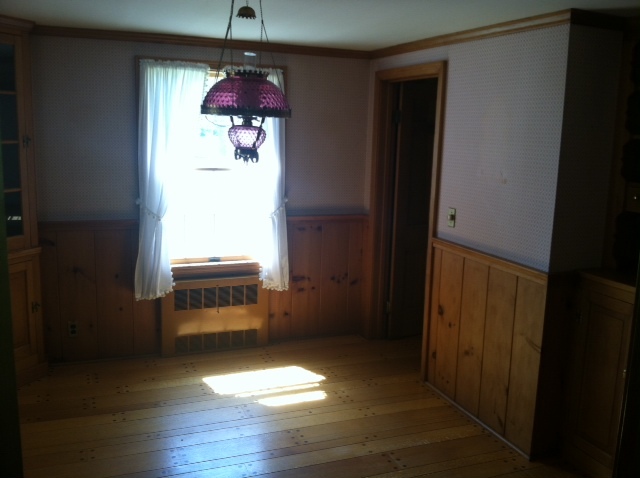 To the left of the door, there’s a small cedar coat closet. Walking down the hallway, you come to a door with a knocker on it. Inside, you go down one step to the master bedroom, which has two large closets, taking up one wall. There’s a small bay window on the other side, with a lovely wood inside ledge. The third wall has an alcove with a large mirror. Adjacent to the master bedroom there’s a bathroom with a whirlpool tub as well as a laundry room with hookups for a washer and dryer and a sink. The laundry room has an outside door, so collectively, the master bedroom/bathroom/washroom make up an in-law suite. My parents are going to live with us during the warm months, so this will be their place. Going back through the hallway, directly in front of the breezeway door is the kitchen. It has red formica countertops which my father likes, though I’m thinking we might replace them with granite. I’ll let my wife cast the deciding vote on that. There’s a double sink, an electric range (which both Jill and my father prefer to gas), and a refrigerator. There’s also a built in half-hutch in the corner. There are beautiful wooden cabinets along the left wall and the wall with the sink. I’m not talking about the thin pressboard sort of wood you often find today—this is beautifully finished solid wood. Also on the left wall is a walk-in lighted pantry, with nicely cut inside shelves going around its perimeter. The wall with the sink has an opening, lined on the outside with stained glass, serving as a pass-through window to the next room, which we call the solarium. 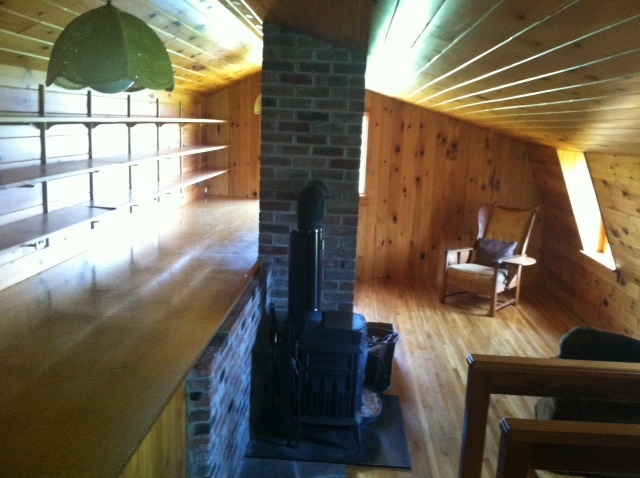 One long wall of the solarium has a built in bookcase at one end, a built in hutch at the other, and a bricked wall area in between with a very nice woodstove. Right next to the woodstove is a small door, behind which is a wood storage area (there’s a door on the opposite side of the storage area to load it from). 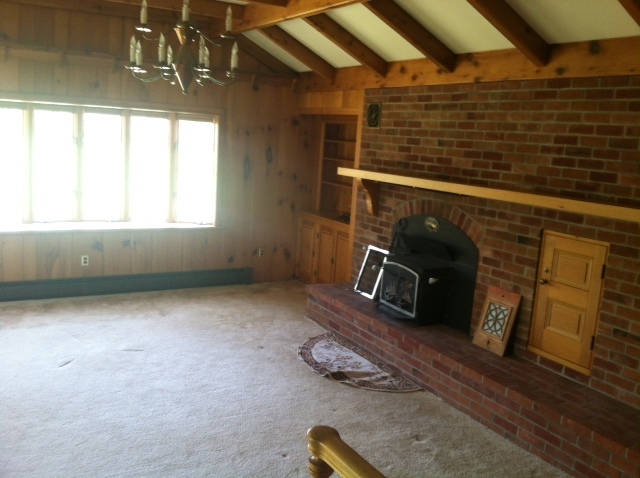 Above the woodstove/bricked area is a large mantle, where I’ll put a big-screen HDTV. The other two walls of the solarium have rows of windows to the back yard. There’s also a set of sliding doors to the yard. Each of the windows and the doors have beautiful pull-down accordion shades. The ceiling of the solarium is arched with wooden ribs, and there’s a high mantle on two walls for knick-knacks. To the left of the breezeway door, there’s a small hallway that goes to a room that could either be used as a bedroom or as a bonus room. I’m going to make it a music listening room. Again, there’s a small bay window with an inside ledge. There’s also a door to the cellar, which is quite large, but unfinished. We’ll probably finish at least part of it in the next few weeks. Also along the hall is a half-bathroom and another closet. Opposite that hallway is the dining room. The first thing you notice is the beautiful wide-plank hand-pegged floor, which is just magnificent. There’s an antique glass lamp hanging from the ceiling in the middle of the room. Along the long wall, there is a set of built in long drawers for dishes or linens, with a row of apothecary drawers above them. There are also two built-in corner hutches. Going through the dining room, you come to the front hallway and the front door. There’s a coat closet to the left of the front door, a stairway going up to the second floor (which has three steps up straight, a small landing, three steps up to the right, a small landing, and six steps up straight) with a beautiful banister. There’s another cedar closet to the right of the steps. Continuing through the front hallway, you enter the living room. The interior long wall is all wood, with a beautiful fireplace in the center. There are windows on the two opposite shorter walls, and another bay window and ledge on the outside long wall. Upstairs, there is a large bedroom with a fireplace (which will be Jill and my bedroom), a smaller bedroom for Mark, and a small bedroom which will serve as my office. All have nice wooden floors. The office bedroom has a nice long cedar closet along its long wall, and a little closet opposite it. There’s a door in the back of the room that leads to a walk through cedar closet. Walking through the closet, there’s a door on the opposite side, which leads you into a storage room, behind which is another storage room. We’re going to get a door cut through the far wall, because that will connect that storage room with the storage area above the garage. The most amazing thing about the house is that there’s yet another door on the left side of the first storage room. If you go through it, you come to a 14×20’ beautiful all wood paneled room, with a large platform along the inside long wall, with shelves along the whole length all the way up. The chimney and a wood stove are in the middle, and there are windows on the other two walls. We call this room “the man cave”, and everyone who’s seen it has been staggered. There’s also a fairly steep stairway to another room downstairs, which is used for wood storage and also encloses the house’s well. The house also has a beautiful front lawn, and nice backyard, and a huge side yard to the right—big enough for a football field. Once we get the first half of our stuff unboxed, we’ll have an open house or a party and invite everyone by for a look see. It’ll still be only partly done, since the other half of my stuff from Georgia, including much of the furniture, will be coming up a few weeks later. Other than my own beautiful house, I had the pleasure of attending three events this past week in really beautiful homes. Last Saturday (the 13th), I drove to Morristown to the annual party given by Preston Carlisle, a friend of the College. President Kennedy, the former president at SUNY Canton, had attended every year during his presidency, so I had a legacy to live up to. The house was simply gorgeous, with beautiful landscaping all around and terrific views of the St. Lawrence River along its long axis. Especially impressive was the boat house, which not only has beautiful river views but also projects out onto the river, so that the river actually runs under it. The party was wonderful and I met lots of new friends. Preston took the time to introduce me to several people, and also gave me a personal tour of the boathouse. Who did I see there? President Kennedy and his wife, who therefore still hasn’t missed one of his parties. On Thursday afternoon, I drove up to Hogansburg (a little past Massena) for an alumni gathering at Gil White’s (’68) house. The house sits at the end of a small peninsula. You drive in through a set of gates, just like you would for a house in Hollywood. The grounds are beautiful, with fantastic views of the St. Lawrence River. The house itself is impressive, with a bedroom with three walk-in closets, with sliders out to an outdoor patio overlooking the river. There’s a large kitchen and bar area, as well as a dining area and a beautiful living room with great river views. There is a projection room that would make any movie mogul happy, with seating for eight. 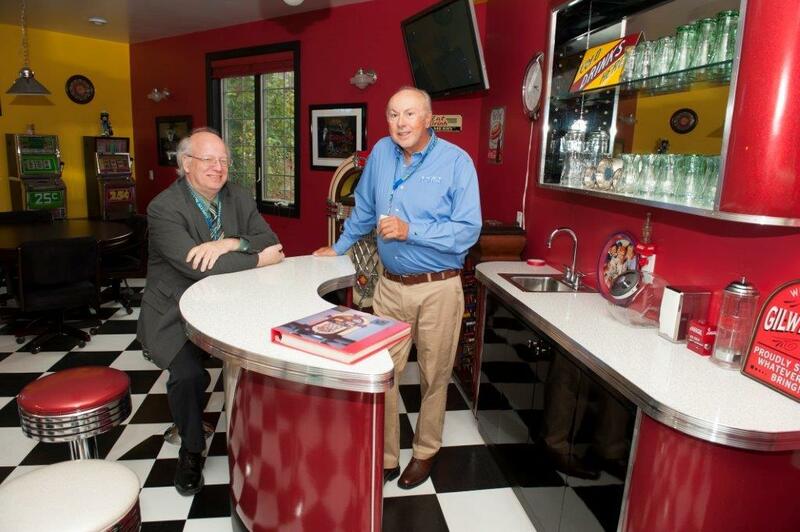 Perhaps the most fun space in the house is a 1950’s room, complete with bar area, jukebox, men’s and ladies rooms, old fashioned slot machines, Elvis Presley gold records, and lots more. The party was really nice and I had a chance to meet several alumni and their spouses, several of whom are also on the SUNY Canton Foundation. President Kennedy and his wife were also there, and we had some fun toasting each other. On Saturday evening, I attended a potluck party way out in Hermon. The party was at a beautiful two-story house with big windows all around, made of natural wood. The first floor was open-concept, heated with a large adobe oven. There was an inside garden and about 20 chairs laid out to listen to a musical performance. I love houses that are reflective of the personality and interests of their owners and this was a really interesting one. The potluck (delicious food!) was followed by a performance by a quartet of bluegrass performers, consisting of two from SUNY Canton (Lenore VanderZee on guitar/vocals and Rosemary Philips on mandolin/vocals), one from St. Lawrence University (Catherine Jahncke on bass and guitar), and one from the TAUNY Center (Camilla Ammirati on banjo/guitar/vocals). The group sang a number of old bluegrass and country songs, as well as some original compositions by Camilla. The group was absolutely wonderful, and I’d recommend that they do some recording immediately—I’d buy a cd by them anytime. Last week was filled with an interesting range of meetings, and I’ll provide a recap of a few of them. I had the chance to meet with the faculty from two of our departments—Mathematics on Tuesday morning and Criminal Justice on Wednesday afternoon. The math faculty wanted to talk about MATH 106, College Algebra. They had run some test sections of MATH 106 with four contact hours of meetings (it’s still a 3 credit course), and the student success rate (% of students getting an A, B, or C) shot up to almost 75% from well below 50% the old way. Math 106 is a critical gateway course that has hitherto been a bottleneck for students in many of our degree programs. As is the case at many colleges, students had real problems passing it, resulting in the low success rates. The math faculty wanted to know if I would support making the course four contact hours permanently. I plan on bringing this to the next Deans Council meeting to make sure there’s support for this, but at first blush, it seems like a really good idea. While any class would probably benefit from the extra time, the difficulty most students have with math makes investing some resources in this area a sound proposition. The Criminal Justice faculty wanted to discuss a proposal to convert their program from BTech to BS degrees. Since the current BTech programs were attracting students and were of high quality, they asked: “why change them?” Conversion to a BS would allow for more liberal arts in the degree, giving students a broader and more flexible background, which would provide more context for what they are learning. In order to stay under the 120 credit hour cap, though, some of the technical courses in the major would have to go, or become part of a basket of courses that students could choose among. After some discussion, we all agreed that it might be desirable to offer both the BTech and a BS version of the Criminal Justice degree, as both had attractive features and the addition of the BS would engender almost no costs, since all the courses in it would likely already be being offered. The department will generate a draft version of the new degree to submit to the faculty by November. I also met with the CO and the XC of the Associated College’s ROTC chapter on Tuesday. They described the program, which is largely based at Clarkson University but has students in it from Clarkson, Potsdam, St. Lawrence, and Canton. It sounds like a great program, and they will be doing some of their physical education work on our campus in the near future. Also on Tuesday, I had the pleasure of meeting and giving a welcome to our international students for a reception and dinner. About 40 of the 50 international students were there, and I met folks from Canada, China, Gambia, Latvia, Sri Lanka, Sweden, and Venezuela there. We talked about a lot of things, but quickly moved on to the most important thing of all—soccer! Of course, the Canadian and Latvian students argued it was hockey, so I’m going to have to acquire that taste in the near future. After the reception, I had to dash off to Clarkson University because I was being interviewed by Donna Seymour (from the St. Lawrence branch of the American Association of University Women) for a Cable TV show they produce called North Country Matters. The interview was quite enjoyable, and those of you with insomnia can cure it by watching the video below. Wednesday, I served as a judge at a business communications course taught by Dr. Fenner. He had given the students a Kobayashi Maru scenario (a nod to Star Trek—this is a test given to Star Fleet cadets to see how they’d handle an impossible situation) regarding a pharmaceutical company that manufactured a profitable drug that was found to likely cause 40-50 deaths per year by the FDA, and was in line to be banned. The students had to decide what to do, write a press release, and then take questions from reporters (him, me, Greg Kie, and J.D. Delong). It was interesting to see how the students reacted to the questions—some were quite poised and handled themselves well, whereas others could have used a bit more practice. Also on Wednesday, I was interviewed by a reporter for NNY Business, followed by speaking with the students at the SGA Senate Meeting. After the meeting with the CJ faculty, I dashed home for a bite of dinner, and then back to campus for the big event of the week. 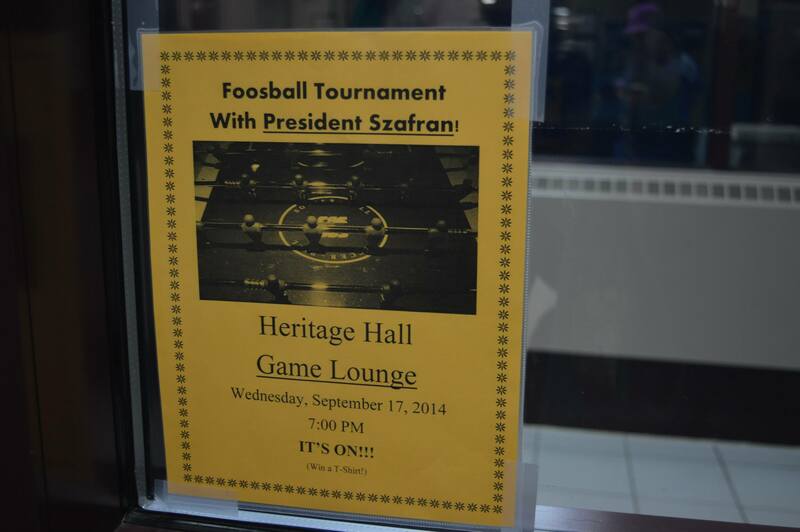 At seven that evening, I went to Heritage Hall, one of our residence halls, for the 2014 Foosball Tournament! 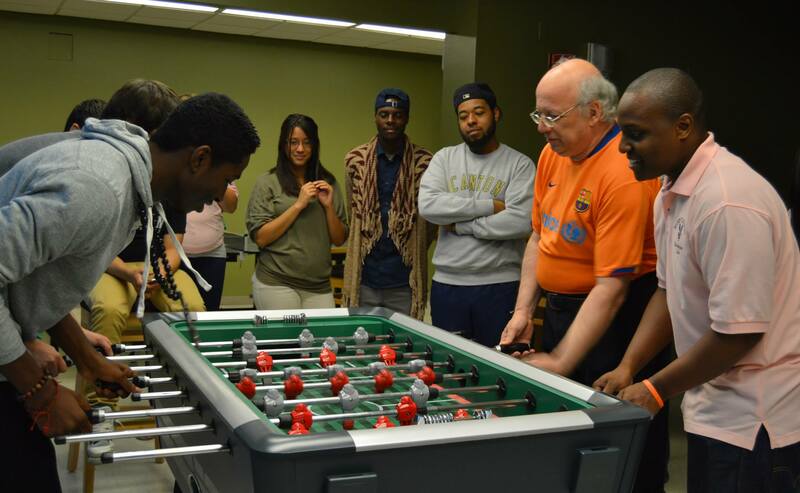 In each of the six residence halls, they had held a tournament to identify the top student team. 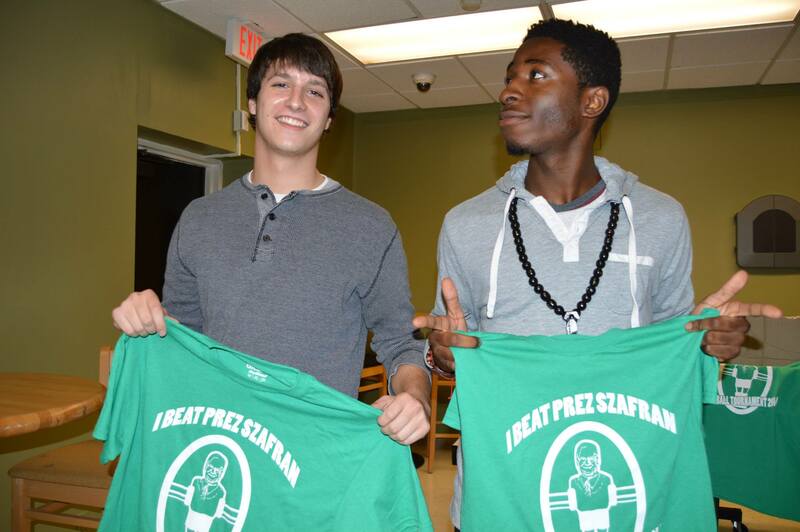 They got to participate in the tournament, taking on a team composed of their dorm director and me. 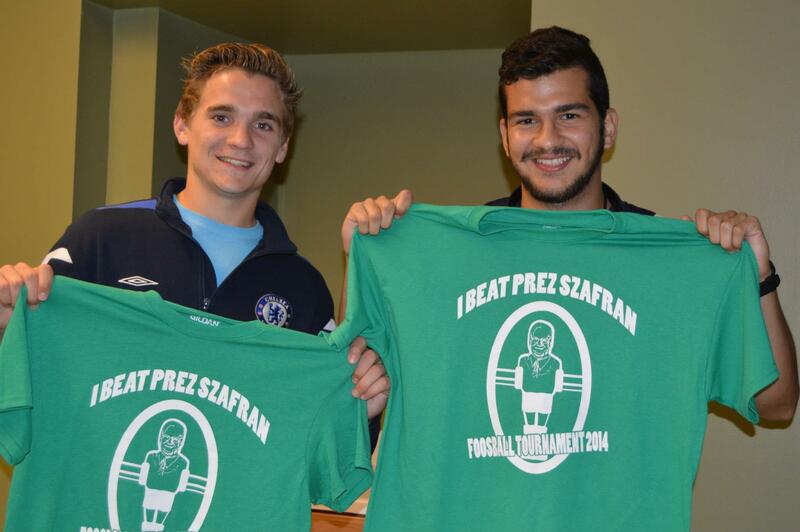 Student teams that beat me and their RA won a green T-shirt that said “I beat Prez Szafran—Foosball Tournament 2014”, with a picture of a foosball man (with my face!) in the middle. So how did the old man do? My record was a respectable 3 wins and 3 losses. Two of the losses were pretty close too, though I have to admit that one student team (made up of two of our soccer players) pretty much blew us out of the water. 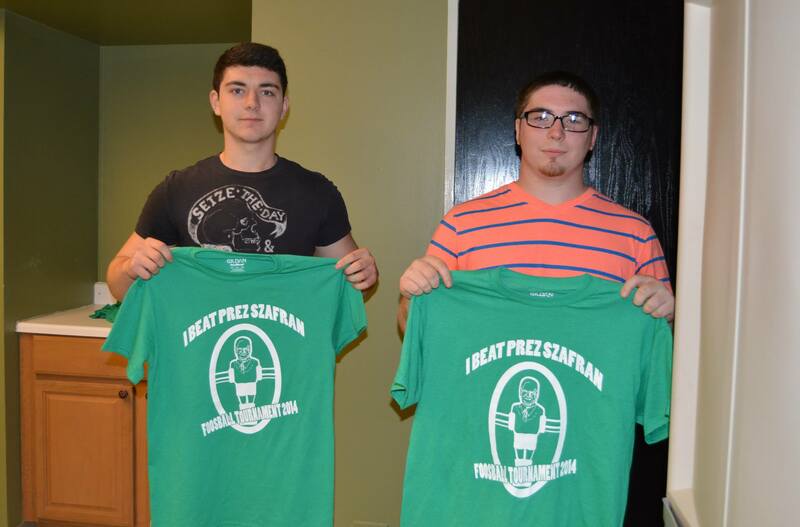 It was lots of fun, and the student winners should wear their T-shirts proudly! Friday morning featured the Foundation Board meeting. I gave an update that was similar to the State of the College Address. The Foundation is doing well and does a splendid job in supporting the College, especially in the critical area of scholarships. At noon, the annual scholarship luncheon was held, with the largest number of participants every—over 350. It was a pleasure to meet former interim president Robert Fraser (he served in between presidents MacArthur and Kennedy), and to see so many alumni, scholarship donors, and well-dressed students. In the afternoon, the Executive Cabinet met. Some of the items discussed included how we might increase support for faculty development, and starting a review of some of our administrative policies toward students. Stop! Take it easy! Cool it! or Cool your jets! Slang for “jail”. The cooler. Vegetable-based phrase meaning “in complete control of his emotions”. Cool as a cucumber. Movie where the sheriff told Paul Newman, the lead character, that they were having “a failure to communicate”. Cool Hand Luke. Classic jazz album by Miles Davis, featuring recordings by his nonet from 1949 and 1950. Birth of the Cool. Since the holidays of Rosh Hashana, Eid al-Adha, Columbus Day, and Diwali are almost upon us, this week’s trivia contest has answers all associated with the word “holiday”. As usual, the first with the most takes the prize. No looking up the answers now! SEND ALL ENTRIES BY EMAIL TO president@canton.edu since if you put them as a response on the BLOG, everyone will be able to see them! Annual football game played at Qualcomm Stadium in San Diego, California. Classic movie starring Bing Crosby and Fred Astaire, also a chain of motels. Song sung by Lindsey Buckingham, it was featured in the movie “National Lampoon Vacation” and is now the Chicago Blackhawks victory song. Audrey Hepburn movie set in Italy, it’s one of the best romantic comedy films ever. Largest touring company of professional skaters.